Amazing how quickly the weeks are flying past (1 October already). The shops are displaying more and more Christmas items and it won’t be long until we are hearing jingle bells as we shop. How good was the storm yesterday? Welcome back Wet. Seems a number of us got caught out in the rain J As the humidity increases many of us are finding it a little harder out there running. We are certainly a more sweat soaked as we finish. So best we all enjoy our next few triathlon format events before we change to aquathlons for the wet season. E News will be having a short break. Any announcements during this time will be made direct to our website and Facebook so please check in regularly. E News will be back in your inbox 22 October. 1. To assist our volunteers, all members are requested to bring TA card or copy of membership receipt to registration at our events. 1. A subcommittee led by President Phill Hatty & including Steve Goat, Glen Scholz & Tony Cox, has been formed to look into the design and purchase of a new club trailer. 2. Our treasurer Karen Lewis presented the audited accounts (attached for your information) and new budget. 3. Further discussion took place on the purchase, use and storage of a defibrillator. A number of the committee recently attended a defibrillator demonstration by Sports Med NT. We thank outgoing Vice President David Croser for his research of this project. New committee member Sue Parora is now looking into the available options. 4. We are seeking expressions of interest from volunteers willing to be part of local organising committee (LOC) for an aquathlon at the 3rd Asia Pacific Outgames to be conducted in Darwin 10-16 May 2014. Please email here if this is something you would like to volunteer to oversee. 5. Graeme Parsons will be handing over to Renee de Jong who has stepped into the Secretary role. 6. Calendar subcommittee are targeting an exciting new venue to add to our calendar next year. 7. On communications, our LIKES are up on Facebook and our new website is providing timely information to our members. 8. 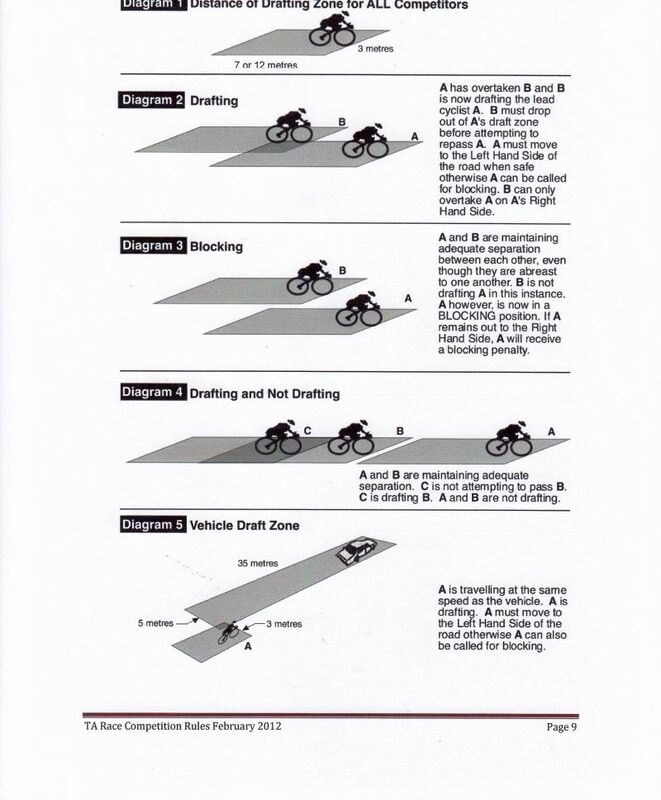 The issue of drafting has again been raised at committee level. Introduction of a “name and shame” policy was discussed. We would like to appeal to all members to do the right thing at our events and for the more experienced to set a good example for our newer members. Drafting is against the rules and is cheating. Please choose to do the right thing at our upcoming events. 1. Well done to all club members who participated in the Relay for Life. Team Tri did most laps and are already plotting strategy for next year. Grant Preddy (individual) chalked up 120km. 2. Junior members please note that there are some changes to Junior triathlon skills dates. Please check junior pages. 3. Tim Green was 4th overall at the Singapore Triathlon. Nice work Tim. A field of 1000 a big change from our local events. 4. Some of us have more trouble than others trying to get to our events. Rowena Eastick had every intention of doing the last tri but by the time she removed the cobwebs and possum nest from her road bike, and repaired 2 punctures late on the Sat arvo (rim tape disintegrated, so spokes kept puncturing her tubes! ), she realised her road bike needed a bit of an overhaul - was even going to race on her MTB, but then slept through the alarm! 5. Maybe (5) above should be a “Dag of the Year” nomination! Don’t forget to drop us a quick email is you see someone doing something “daggy” out there. We keep all nominations confidential and drag them out at our next presentation night J. Same for any crashes that happen. Let us know about them so they can be in the running for the Broken Spoke Award.